Apple’s macOS 10.13 High Sierra launched two years ago now, and is obviously not the current Mac operating system – that honor goes to macOS 10.14 Mojave. 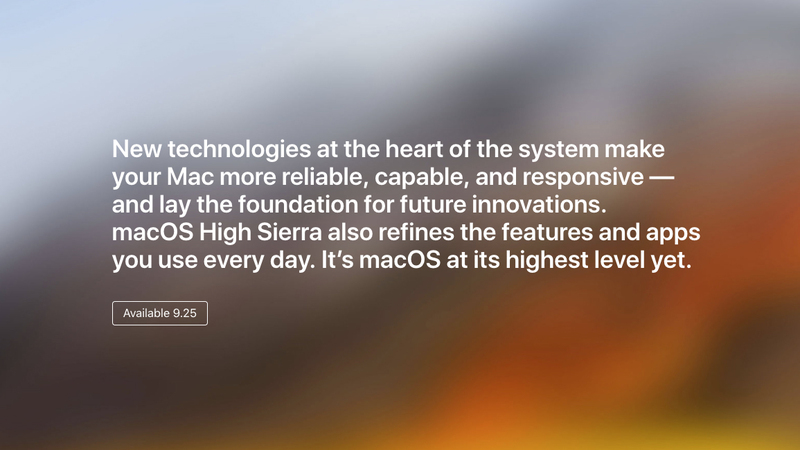 But, because Mojave increased the system requirements by a significant margin, many people will be using macOS High Sierra for years to come. Not that we’re complaining: during its time in the sun, macOS grew to be one of the best versions of the Mac operating system to date – even if there were some security issues at launch. However, these days, not only have all of the launch issues been patched out, but Apple continues to provide security updates, even in the face of macOS Mojave. And, while macOS did include some time-saving photo editing tools and a whole new file system, but macOS wasn’t immune from criticism at launch. Namely, it was criticized for simply iterating on Sierra – just like Mountain Lion did after Lion. Still, just because the improvements are relatively minor, doesn’t mean they aren’t there, so we’re going to explore everything there is to know about macOS High Sierra. Apple revealed macOS 10.13 High Sierra at the WWDC 2017 keynote, which is no surprise, given Apple’s tradition of announcing the latest version of its Mac software at its annual developer event. However, it wasn’t until September 12 that Apple revealed that High Sierra would launch little more than a week later, on September 25. There was a developer beta of the operating system you could enroll in leading to the final release, but that’s not necessary anymore – the final build of macOS 10.13 has been out in the wild for more than a year now. The final build of macOS High Sierra, 10.13.6 is available right now. Beside a few bug fixes, it integrates Airplay 2 into iTunes – though you will need to update iTunes to take advantage of it. You can download the update from the Mac App Store. More importantly, this update contains the bug fix that stops the Core i9 MacBook Pro from thermal throttling. And, you can be sure that Apple will continue to release security updates for macOS High Sierra for years to come. Safari 12 is also available for macOS High Sierra users, which not only supports website icons in your tabs, but also has better security. Websites, for instance, won’t be able to track your specific Mac when using the native web browser. If you’re ready to jump to the next version of macOS , you can download macOS Mojave today. And, fortunately, we can show you how to download and install macOS Mojave. Luckily, because macOS High Sierra doesn’t really shake things up, the barrier to entry didn’t change. In fact, macOS High Sierra has much more lenient requirements than Mojave, so it should be popular for a while. As long as you&apos;re on one of the following Mac models, you can upgrade to macOS High Sierra (if you haven’t done so already). Bear in mind that if you want to take advantage of the High Efficiency Video Coding (HEVC) benefits posed by macOS High Sierra, you’ll need a Mac donning – at the very least – an Intel sixth-generation Skylake processor. Unfortunately, that discounts everything released prior to 2015, but on the bright side, everything else macOS High Sierra brings to the table is fair game. Beyond the Hackintosh users being reasonably worried about the newly enforced security checks on EFI firmware automatically implemented each week, Apple has revealed a number of awesome new features with macOS 10.13 High Sierra. The new and improved Safari is one of the most major improvements: it will stop ad-tracking and auto-playing videos in their tracks. But, macOS High Sierra also brings Spotlight Search to the Mail App, along with allowing the Mail app to display a split view for the compose window. And, as an added bonus, macOS High Sierra takes up 35% less storage space. 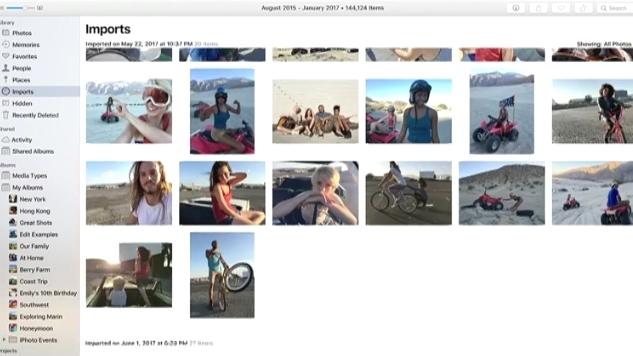 Photos also sees improvements, with a better sorting tool. This is thanks to a better layout, improved facial recognition via neural networks, and improved syncing across all Apple devices. This all makes macOS High Sierra’s photo experience better than ever before. Editing tools, too, have seen improvements, in turn making it easier than ever to enhance the quality of your photos without learning the ins and outs of Photoshop or Camera RAW. And of course, you can count on Instagram-like filters being a part of this. One of the biggest changes that comes with macOS High Sierra is with the file system. It’s ditching the HFS – which Apple has used for around 30 years, and is now using the Apple File System (APFS) instead. Every Mac that has been upgraded to macOS High Sierra will receive these file system updates automatically with the exception of those sporting Fusion Drives and older HDDs. 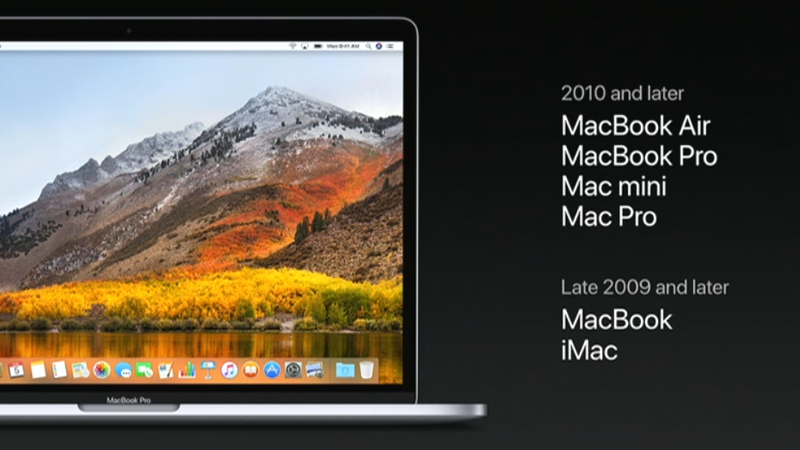 Similarly, all new Macs will ship pre-formatted for APFS. To be exact, APFS is a 64-bit file system that supports native encryption and faster metadata operation. This may all sound a bit techy, but the bottom line is that this will make your Mac feel a lot faster, while also being more secure and more transparent about the nature of your files and folder contents. Unfortunately, this comes with the caveat of Apple’s confirmation that 32-bit apps will be discontinued in later versions of macOS High Sierra. The update also brings HEVC, or H.265, video compression to the Mac. Apple claims that this new standard can compress video files 40% more than the previous-generation H.264 standard. The end result will be faster video streams at higher resolutions – ahem, 4K – and smaller video files sizes when stored locally. One of the biggest bits of news surrounding macOS High Sierra is that it will finally bring support for virtual reality headsets officially. 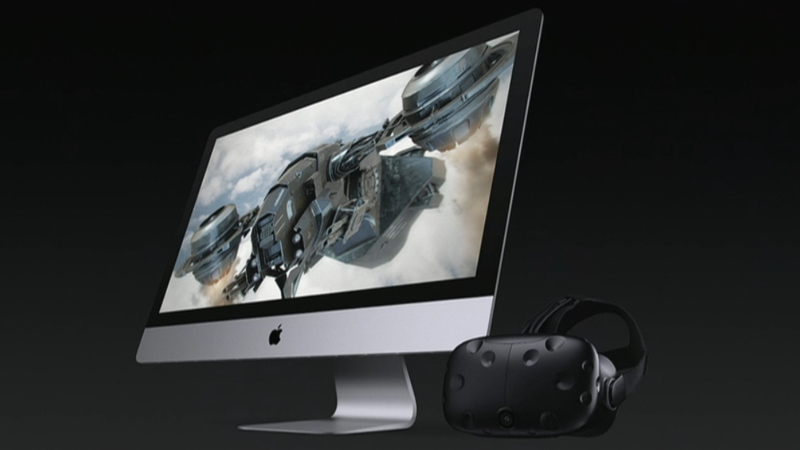 Namely, the HTC Vive and Steam VR will work with Macs running the new OS this autumn. However to use such a device, you’ll need at least a 5K iMac or MacBook Pro – or, any Mac that can run the new OS with an external GPU solution. Support for such devices comes part and parcel with macOS High Sierra, but won’t be an active function until later this year. The good news is that macOS High Sierra comes with a helping of refinements to its graphics API that make up for the scarce GPU support. 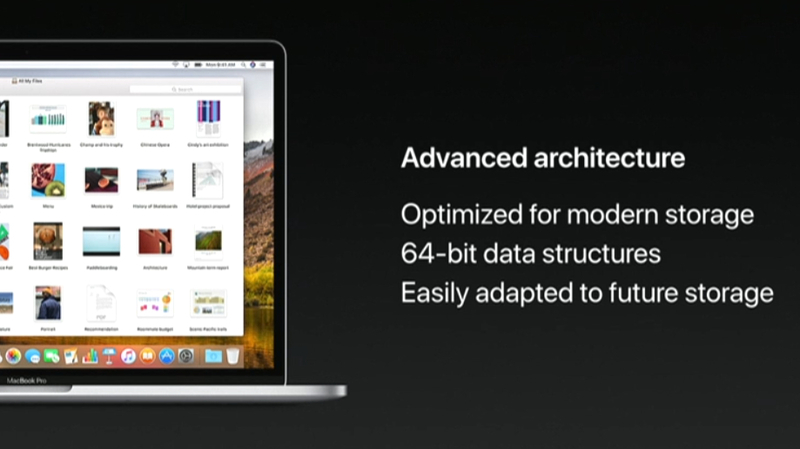 Metal was a step forward for hardware-accelerated 3D graphics, but with Metal 2, Apple promises less strain on the CPU as well as proper machine learning and better Xcode profiling/debugging in macOS High Sierra. Perhaps more important, though, is the fact that MoltenVK was recently brought to Mac by Khronos Group. An implementation of the open-source Vulkan API, it’s said to bring frame rate gains of up to 50% in Dota 2. As it’s cross-platform, too – being supported by Windows and Linux as well as Apple’s devices – MoltenVK is likely to be more widely adopted by creators.